I think that one of my favorite things about receiving Tiger Tales Fall releases is to open the box and see what Christmas titles they are coming out with! I've just thoroughly enjoyed their Christmas holiday themed children's books and Fall 2010 did not disappoint! This year I opened the box to discover a few books that I wanted to share with you - one that was perfect for Bookworm1 (age 4) and one that was perfect for Bookworm2 (age 1 3/4). 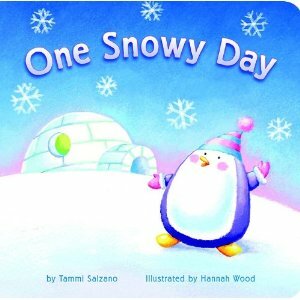 First up, there's One Snowy Day which is a padded board book (making it just the right fit for Bookworm2!) This short and cute book features a penguin and encourages counting skills. We count "1 woolly hat, 2 warm mittens, 3 happy friends" and so on and so forth. The illustrations by Hannah Wood are cute and cozy. I also love the fact that the snowflakes are a metallic silver so they shine on each page giving the winter scene a fun appearance. Definitely a winner of a book in this house! Secondly, we discovered 'Twas the Night Before Christmas in our box of Tiger Tales goodies. Honestly, I can't tell you who enjoyed this book more - Mommy or Bookworm1. It's a toss up. So let me tell you why I absolutely love it! You know how each year I rave about A Magical Christmas (linked to past references!) because each page has sparkles on it?! Well, 'Twas the Night Before Christmas follows in kind with cute little mice and glittery snow drifts, swirls around flying reindeer and on decorated Christmas trees. (I'm a sucker for the glitter and sparkles, I guess!) Kat Whelan provides the illustrations in this book which follows the traditional poem. Cute, cute, cute! And it's cute. Just wanted to make sure I mentioned that! Now, as delighted as I am to have added these two books to our Christmas reading repertoire, I am also excited to giveaway a copy of each of the above mentioned titles to one of you. Tiger Tales has graciously and generously offered a copy of each to one of my readers here. In order to win simply leave a comment below. This contest will be open through Thursday, November 18th. THIS CONTEST IS NOW CLOSED. THE WINNER, as selected by random.org, IS #30 - SKY! Congrats, Sky! I'm a blog follower. Thanks for the chance! This is the year that I want to add lots of Christmas books to our collection, and these look great! This week I bought one book. These sound like so much fun!!! Please may I enter? Oh and I follow you as you know! My little one's would love these books! I would love to have these books to share with my nephews. I also subscribe to your blog. Thank you for offering this giveaway. Yes, enter me too! I've been asking around on FB and to my friends for Christmas book ideas for my kiddos! Please enter me.. I'm a blog follower. Thanks for these great reviews of our Christmas titles. And an even bigger thanks for your continued support. Good luck to all of your Giveaway entries! Thanks for the opportunity :). I am continuing to build our Christmas book collection. My family had a tradition of getting a new Christmas picture book every year when I was growing up and I have continued it with my family. I am also slowing picking up the books that we had growing up as well and getting some board books to have for my daugher (and future kids that come along). I'm in the Christmas mood quite early this year too. I don't think it's a bad thing as most years it feels like Christmas is over before I really get a chance to enjoy it! extra comment! :) I thought about doing this for my latest giveaway too... we'll see! These books look like a lot of fun. I have several in my family between my kids and nieces who would love these. 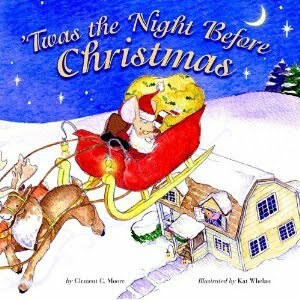 Please enter me--I love kids christmas books! Please enter me! And I join you in belting out the carols! MERRY CHRISTMAS! Please enter me. Merry Christmas to you too! Please include me! My little girl loves books! Thanks! The little boys here would adore this!